Doors will open 30 minutes before the opening of the performance. Available from Sunday 3 June, 2007 at 10:00am. 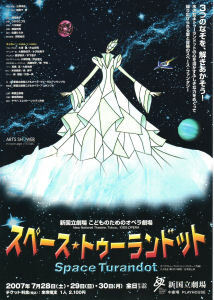 * Kids Opera is a performance of opera mainly for elementary school students and accompanying adults. * Please refrain from taking children aged less than four with you or allowing them to enter the theatre. * Please buy one ticket per child. * No discounts apply to these tickets. Far beyond the galaxy, Queen of the iced planet Gelato “TURANDOT” is beautiful but her heart is so cold like ice and intolerant unless she is the most beautiful lady in whole universe. At a certain moment, she got to know Princess of planet Flora “LAVENDER” is considered more beautiful than her. Then, she ordered her men, PEPE, RON and CINO to kidnap her. During Princess’s birthday party at her planet, these 3 gangsters appeared and tried to take her away. Her friends fought against them and her close friend TAMTAM called Captain LEO of Space Cadet. But, his spaceship crashed the planet by the special power of Queen and in the unguarded moment Princess was kidnapped. The King of Flora, her father, asked Leo and Tamtam to bring her back. They repaired the ship and departed to Planet Gelato. Let’s see how their fates are going!